I was bitten by the fitness bug very late in my life – at the age of 64. The first thing I did was, I joined a gym in my neighborhood. It has now been almost 6 months since I started going to the gym. What I have seen during this period is many of the novices like me try to imitate top bodybuilders and train hard, but don’t give a damn about nutrition. So, the time and efforts they spend on workout do not translate commensurately in gaining muscles. After discussing with many fitness experts, I realized the secret lies in nutrition. Knowing how nutrition works is as important an aspect as the exercise. This works for anyone and everyone, whether for general fitness or for that matter even to build lean muscle mass. No, I am not going to ask you here to buy those expensive supplements that your body builder idol guzzles. The objective of this article is to share with you my list of the top naturally available foods that help to build muscles fast, and thereby gain more muscle mass and strength. What Foods Build Muscle Mass Quickly? 1. Eggs: Eggs contain high quality protein (6 to 8 grams per egg), nine essential amino acids, choline, the right kind of fat, and vitamin D. They are also rich source of vitamins, zinc, iron and calcium. So, without any doubt they are one of the most complete muscle building foods. Many recent studies have found they they are not harmful for your health. Fitness Tip: Egg yolk too helps a lot for gaining muscles, where the cholesterol is found. If you’re worried about your cholesterol rising up due to eating the yolks, here is good news for you. Cholesterol from eggs has been found to reduce the amount of LDL (bad cholesterol) particles linked with atherosclerosis. 2. Skinless Chicken: Chicken is a superior source of good quality protein, which is a key factor in keeping up muscles and their repair, bone health, and weight upkeep. Family Fitness Tip: Chicken breast is the best portion and contains almost 30 grams of protein per 100 grams. You can cook and enjoy it in many ways. 3. Cottage Cheese: Do you know cottage cheese is almost totally pure casein protein? One cup of cottage cheese provides you with about 28 grams of protein. Casein is a slow-digesting protein, so it’s a perfect choice for the upkeep of your muscles. And it’s very useful particularly if you have no choice but to stay for long periods without eating. Cottage cheese is also a rich source of vitamin B12, calcium, and other vital nutrients. Total Fitness Tips: Casein protein is one of the slowest-digesting proteins. You can eat it as a night snack so as to save your muscles from being consumed as an energy source while you fast during the night. 4. Tuna, Wild Salmon And Other Fish: Fish are packed with omega-3 fatty acids, high in protein and low in fat. Omega-3s are crucial, as they help to lose fat and improve proper function of your body processes, including metabolism. 5. Quinoa: A wholesome protein (14 grams of protein per 100 grams) along with essential amino acids is also a great slow digesting carb. It is believed to be associated with an increase in insulin like growth factor-1 (IGF-1) levels, a key factor linked with lean muscle and strength gains. 5. Soy: Out of all the plants sources, soybean has the maximum muscle-gaining benefits. You can take it in the form of edamame, tofu or soymilk. As one of the few plant sources that provide complete protein, soy is believed to be the best. Just one cup of cooked soybeans provides over 20 grams of amino acids. Not only complete protein, soy is a rich source of many other vital vitamins and minerals, making this a valuable alternative to meat and one of the healthiest plant-based muscle-building foods around. 6. Lentils And Chickpeas: They are good alternatives to meat to satify your body’s full protein needs. These vegetarian- and vegan-friendly foods feed protein to your muscles for their upkeep and growth sans the unwanted carbohydrate rush that can otherwise affects your insulin levels. 9. Whey Protein: Out of all fitness supplements, whey protein is most popular supplement, because it provides a fast and convenient source of protein. It’s a fast-absorbing protein and works best when taken post workout. Our advice is that you get high quality protein from whole foods, and use whey protein only as a boost for faster muscle build-up. 10. Almonds: This plant-based food is a perfect example of big things in small packages – absolutely chock-full of protein. Just 1/4 cup of almonds can provide your body with about 8 grams of protein. Moreover, they are great source of heart-healthy monounsaturated fats and magnesium. Magnesium is especially known to be helpful for its energy metabolism and protein synthesis benefits. It’s another beneficial content is vitamin E. This powerful antioxidant is an antidote for free radicals and helps you recover muscles quickly from workouts. 11. Whole Grains: We strongly advise to keep away from refined grains, and instead go for whole grains. They supply more nutrients to your body than refined grains, which help maintaining sustained energy levels and overall health – promoting your growth hormone levels that are crucial for boosting lean muscle growth, fat loss, and strength gains. 12. Healthy Fats: Does it sound strange to you? Fats and Muscles! Believe me, good fat is critically needed for healthy muscle gains. As a matter of fact, they play an important role in promoting hormone production – testosterone and growth hormones, which are needed for boosting muscle growth and strength gains. Moreover, fat helps in maintaining many other important body functional processes. Choose polyunsaturated and monounsaturated fats as they are in fact good fats. To get them, include salmon, other fishes, nuts, leafy veggies, oils such as flaxseed, avocados, and other seeds in your daily diet. Bonus point is they are also rich source of muscles-gaining essentials as omega-3 and omega-6 fatty acids. 13. Fruits And Vegetables: Although they do not contain much protein, but are packed with antioxidants that help in essential healthy functioning of your immune system.They also contain many other nutrients, like vitamin C, vitamin E, and beta-carotene. In addition, they supply your body with fiber, which helps essentially in proper digestion and better absorption of the nutrients. Now you know, nutrition is no way less important than workout – so here are some more Best Diet Tips For Gaining Muscles. 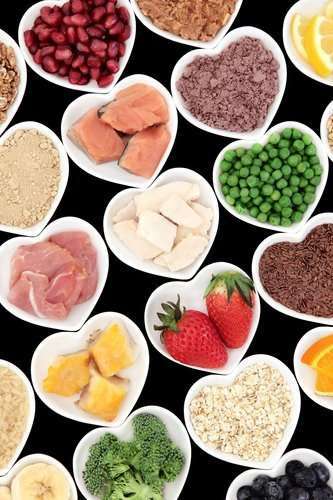 Please do share with our readers what foods do you eat to gain muscles?